Edward was born in 1880/82 The 1911 census places him living with his wife Lavinia at 15 Garden Place Mold. They had no children and he was a coal miner below ground. The form tells us that he had been born in Gwernaffield and that she had been born in Glamorgan. 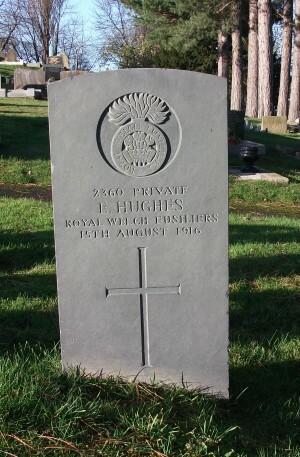 His Commonwealth War Grave Certificate tells us that he had lived in Rhydygolau and that after his death Lavinia remarried someone called Davies.